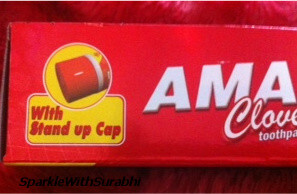 Indian Beauty Blog | Fashion | Lifestyle | Makeup | SparkleWithSurabhi : Amar ToothPaste - 100% Veg, Fluoride Free, Cruelty Free - PETA Certified "Best Vegan ToothPaste"
Amar ToothPaste - 100% Veg, Fluoride Free, Cruelty Free - PETA Certified "Best Vegan ToothPaste"
Labelled 100% Veg on the Tube and the Carton. I shopping yesterday at the Big Apple looking for good vegetarian toothpaste and I came across "AMAR Clove Gel Toothpaste", Certified 100% Veg, with active clove, No Fluoride, No Bone Powder and Cruelty free - PETA certified "Best Vegan toothpaste" with a little bunny logo ( Parent Company of The Nature's Co). I was so happy to see this little bunny logo with ears forming into the shape of the heart. 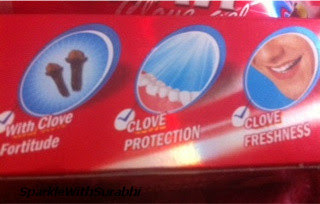 I can confidently say that I have seen a lot of toothpastes with 100% Veg Logo but none till now with a PETA Logo in India and I am very happy. I wish to see more products in India like this which do not harm animals for the welfare of human beings! 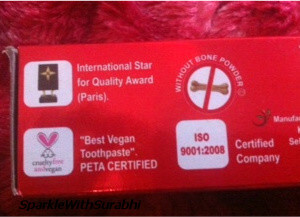 Not only that this Toothpaste was also a International Star Quality Award Winner (Paris). Quality Award Winner (Paris), Peta Logo - Cruelty free & Vegan, No Bone Powder and ISO Certified. Non Fluoridated and Active Ingredient - Clove. I read somewhere on a blog for natural toothpastes that many women in the U.S would love to use toothpaste which non- fluoridated and cruelty free! 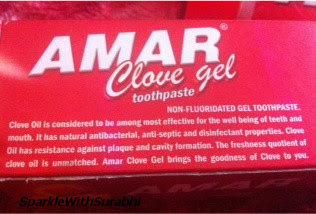 I guess Amar Clove Gel is the answer but unfortunately I have no idea if this product is available in the U.S. I also came to know that many toothpastes or ayurvedic products do write 100% Veg on their box however they may contain "Bone Powder". Now I don't know which toothpaste is that but I will definitely mention it when I am confirmed. Few drops of water to make it a paste. 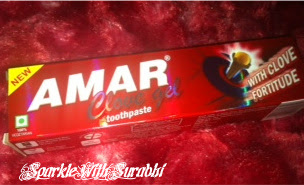 However, This is in case if Amar Clove gel is not Available! 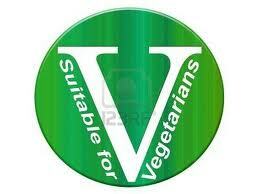 I wish to see more products like this in India with a PETA Logo! Hi, thanks for the info. Didn't know it was flouride free, though I was familiar with the brand. Does it contain SLS (Sodium Laureth Sulphate) ? It makes it foamy while brushing. And does it have a strong mint/menthol effect ? Is it available in South India also? Please chk for the SLS contents on the packaging of the product. Nice blog. Thanks for sharing. 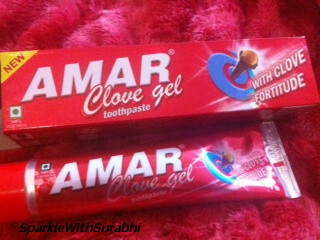 I think Amar Clove Gel is one of the best product right now. I am using Tom’s of Maine Simply White Natural Toothpaste and got nice effort to this product. You can try with this toothpaste.